When we bought our house we hired an electrician to install ceiling fans and lights. He worked, worked, and worked. My illusions of electrician’s work dissolved. Their work is a great deal more like laying bricks than solving equations. Oddly, the truth for electricians is also the truth for electronics. Nearly two years after starting, more than 18~months after finishing the electronics, source code, and cardboard mock-up I finally finished my clock. 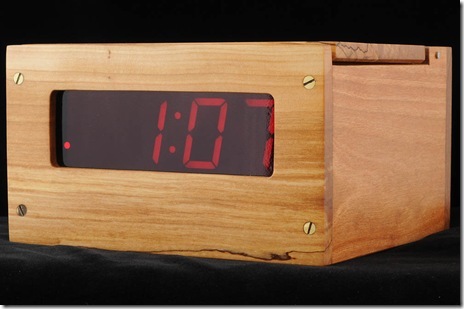 I have recreated—nay, improved upon—the greatest alarm clock I have ever owned. In some ways my clock was started about thirty years ago, when some foresighted person planted a lovely little apple tree in what is now my back yard. The lovely little apple tree was a gorgeous mature giant shady apple tree until the spring of 2012. The spring came warm and early but also trisected by two severe cold spells. The frost killed several of my trees major limbs, and may eventually kill the tree. One of the major limbs became firewood. 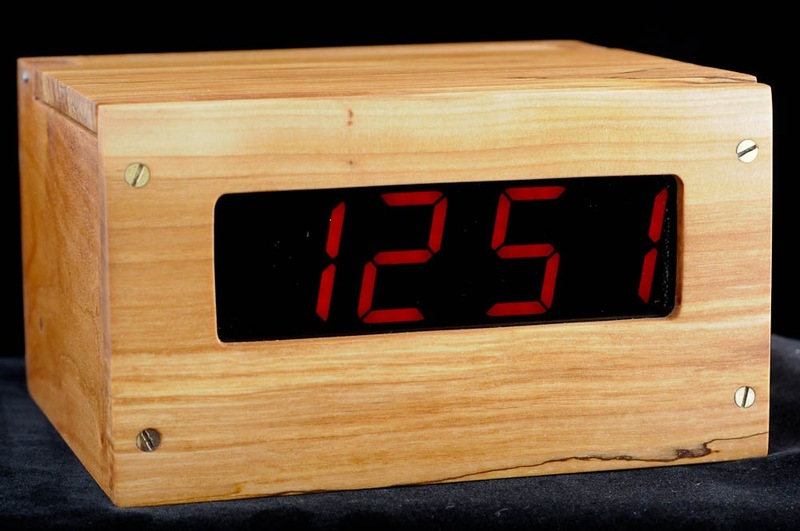 Then one of the firewood logs became boards, and finally one of the boards became the main faces of the clock. Making a board from firewood is, no doubt, ancient. For me it was a new experience with old techniques. I used a hand powered bow saw, affixed the firewood in the vice, and ripped boards by hand. It is a tiresome process and the boards were not machined to the parallel faces you get in dimensioned lumber. No matter, hand planes helped me get one face smooth and flat. I marked a constant thickness, flipped the board over, and planed the uneven face. The finished board was smooth, clean, and beautifully figured. 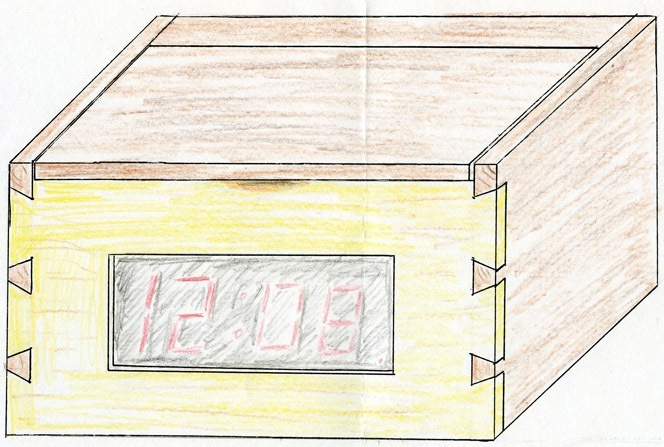 The original vision for the box of the clock had hand-cut dovetails visible on the front. However, the apple wood was unsupportive. It was brittle, and prone to fracturing on detail peices. It was also almost too small. The cherry boards I selected for the sides were not long enough to dovetail join the front and back. The final result is lovely to me. 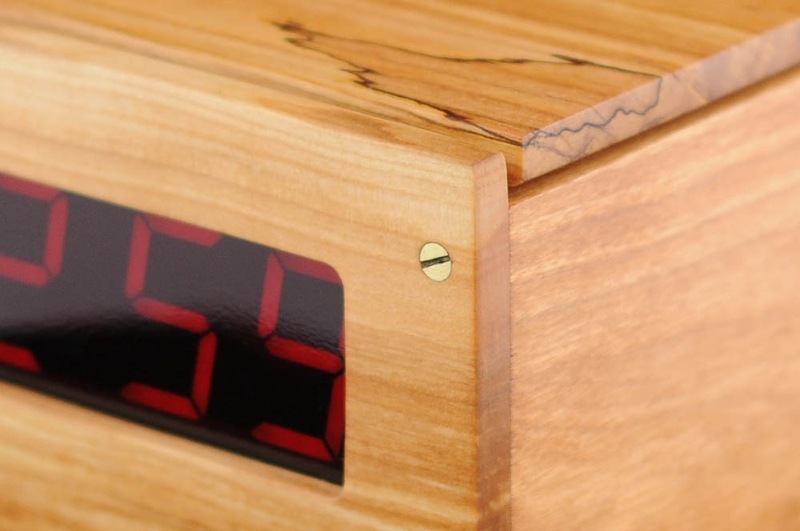 It has a lid so the interface is not visible on the bedside, and the lid showcases the figure of the apple wood. The display is a simple red that does not keep me awake at night. The plain box design weighs enough to keep from migrating around the nightstand, and the interface is actually good. 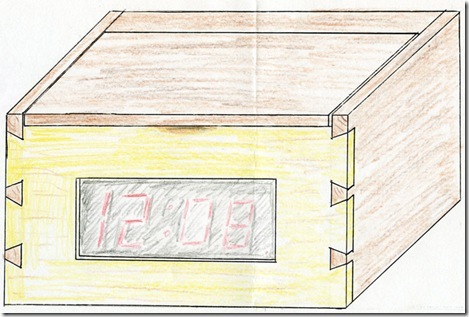 I set out to imitate the functions of my beloved but deceased clock, see Behold! A number pad. 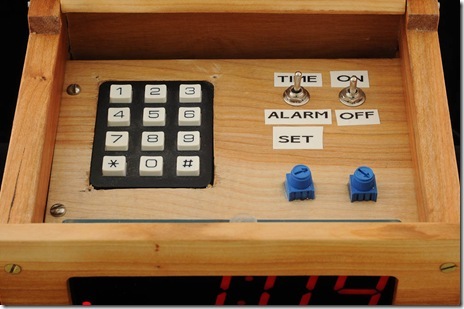 I started the design with a set of use cases, Set Time, Set Alarm, Turn on Alarm, and Turn off Alarm. The notes below are from the original design before I bought the first part, with no edits but formatting. User opens decorative lid. User sets mode switch “set time” mode. The display is turned to current time. User enters numbers starting with most significant digit, in 24 hour time format. After entering the first number, only that digit is displayed. User exits "set time" mode without entering a new time at all. User exits "set time" mode without entering a valid time. Same as “Set Time,” but using “set alarm” mode. User turns on alarm. 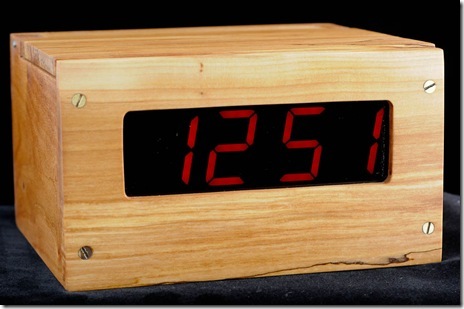 Display flashes time the alarm is set for about 5 seconds. Display resumes normal operation. The “alarm on” LED lights. When the time reaches the set alarm time, a beeper will sound. The beeper will sound until the alarm is shut off. Alarm LED is turned off. If the alarm is currently beeping, the beeping ceases. Pin A3 was used for analog read to determine the state of a simple resistor network. Switching the mode switch changes the resistors in a voltage divider. I designed this before I learned about the Arduino’s internal pull-up resistor, so the analog electronics are more difficult than I would make them today. In case anyone wants it, the code is here also. // sketch was compiled, except on Mac.